I love Lucy and you probably do too. 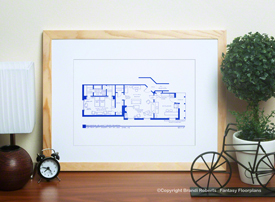 Welcome to my Lucy and Ricky Ricardo floor plan for their first NYC apartment. 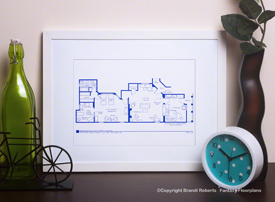 As Ricky might say, let me "splain" this floor plan. In the living room, you'll find Ricky's spinet and brick accent walls next to the fireplace. In the bedroom, you'll find his and hers closets with a bath in between. I've added Lucy's supply of "henna rinse", which she attempts to save while believing there is a fire. We know what's important to her -- maintaining that hair color! 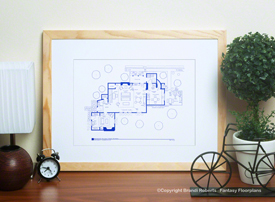 Pair my Lucy and Ricky Ricardo apartment floor plan with Lucy and Ricky's second New York apartment floor plan or the floor plan for the first floor of their Westport, Connecticutt estate. And also the second floor of their estate. Complete your set with my floor plan of Fred and Ethel's apartment!